"Do not hang on to a motor vehicle. It is undesirable to hang on to a motor vehicle even when it is standing in a traffic block, for it may move off suddenly and cause you to be thrown. As it is now an offence to hang on to any moving vehicle you may be fined for so doing, in addition to facing the possibility of an accident (see picture). 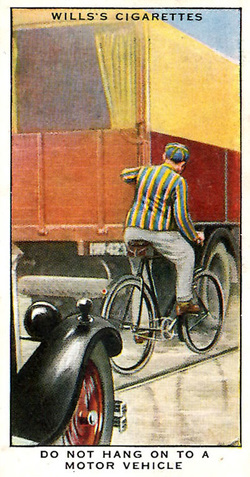 Many cyclists make a habit of riding close behind fast-moving motor cars so as to take advantage of the wind shelter that they afford. This, however, is a dangerous practice, as the car may pull up so suddenly that you cannot avoid running in to it."